If you want to own your Toyota and plan on keeping it for as long as possible, buying, rather than leasing, is probably better for you. Although auto loan down payments are typically between 10 and 20% of the total vehicle price and monthly car payments are higher than those for a lease, once your vehicle is paid off, car payments stop and the vehicle is yours. 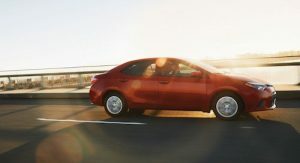 Compared to continuous monthly lease payments and the knowledge that you will have a vehicle to either sell or trade in, buying a Toyota can be cost effective in the long run. Of course, other benefits to car ownership is the lack of mileage restrictions imposed with a lease and your ability to enhance your vehicle with any fancy aftermarket parts you like. If you would like to explore your options for buying or leasing a Toyota in Rochester, NH, we invite you to talk with one of our auto financing experts. We are here to answer your questions and help you get behind the wheel of a new Toyota.